One true hallmark of a bespoke suit is the size of its armholes. Most armholes in ready-to-wear suits (and made-to-measure patterns, to a certain extent) cater for men with larger arms and shoulders, in order to be on the safe side. As with so many other areas of menswear, no one notices when they’re too big, but everyone would notice if they were too small. Smaller armholes are also just harder to make. As bespoke is cut uniquely for you, the armholes can be as small as you want. And the biggest advantage of small armholes is that the arms can move independently of the body of the jacket, without dragging its chest and back all over the place. This effect is accentuated when a larger sleevehead is eased by hand into that small armhole, as accentuated by tailors such as Anderson & Sheppard and ready-to-wear by brands such as Kiton. It would be great if a ready-to-wear suit could be altered to have smaller armholes. Unfortunately, it’s not that easy. A smaller armhole means extra material under the sleeve and in the body of the jacket – and most suits don’t supply any extra here. There is, however, a cheat. If you get your tailor to insert a thin extra shoulder pad into each side of the jacket, it lifts up the armholes and effectively makes them smaller – as the pad at the top is taking up some of that armhole space. The downside is that you have bigger shoulders. But I don’t mind this. 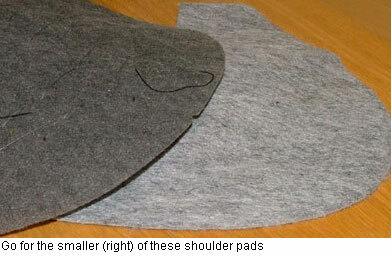 As I have sloping shoulders anyway, I tend to ask tailors to build in a slightly heavier shoulder pad. And increasing the padding in a ready-to-wear suit also lifts up the drape of the jacket, removing the folds that collect next to my sleeves in the back (due to those sloping shoulders). So it suits me both ways. The effect is not the same as a genuinely smaller armhole, of course. The circumference is still the same. But it gets partway there and is certainly an improvement. I wouldn’t recommend it for men with large or square shoulders, and the insert should always be pretty slim, but if you happen to have a similar body type to me, I recommend trying it. You can follow the discussion on A step further in suit alterations by entering your email address in the box below. You will then receive an email every time a new comment is added. These will also contain a link to a page where you can stop the alerts, and remove all of your related data from the site. Paradoxically, I find coats with large armholes, such as you find on most RTW offerings, to be confining. You know you can’t get away with raising your arms and you feel confined, constrained by the garment. It also features one of the finest DB black tie outfits I’m ever likely to see. In their old shop A&S used to pull away a rug to show where Astaire used to practice dance steps to check the dynamics of his latest coat. Great tip about reducing the armhole on an off the rack suit, have never come across that before! Great suggestion! I’ll give it a shot with one of my new vintage acquisitions. My shoulder line is normal-ish, but I’m slender with thin arms, so your scheme should make “artificial” high armholes for me. My Father died last year. We are only going through his belongings now. He had style. It shows in his suits. Some of the were very expensive, some not so, all are very elegant. I am told whatever I dont keep will be given away. As is common, I the son am taller and slimmer than my late father. spare material cuffed at the aknkles for lengthening. The waist however is quit large. Dont get me wrong. If its’ doable I dont mind paying. Hi John, yes it is certainly possible and most tailors will be able to do it for you. Just make sure you find a good alterations tailor. Ask friends for recommendations or use mine, Graham Browne, if they’re convenient. Good morning. I recently thrifted a Huntsman sport jacket and behind the armpit there is more fabric than I am used to seeing and it bulges a bit. My tailor says it is there to provide flexibility when reaching, etc. She is adjusting the back seam (it is dual vented) to reduce the look, but I’m afraid it may continue to bug me. First, is this true that it is on purpose, and two, can this extra fabric be reduced? was just trying on one of my old bespoke jackets and the armhole on one side feels quite tight. its not one Id worn much at all. do these soften out with wear, ie do you have to break them in? Is there such thing as an armhole that is too tight? I’ve recently taken delivery of a bespoke suit (my first) and though it looks beautiful in every way, I do feel the seam of the armhole at the front of my underarm somewhat. It’s not quite pinching, but it’s very much there. Is this normal? Am I just accustomed to a large armhole? It can certainly be too tight, yes. Thanks, Simon. The more I wear it the better it feels. So let’s see what happens! Thanks.